Lynch Landscape & Tree Service, Inc. has decades of experience delivering award winning landscaping services and tree service for the most demanding projects in the Greater Boston and Metrowest areas. Our attention to detail and our unyielding commitment to quality and customer satisfaction, combined with the extensive talent provided by a dedicated and friendly team allow us to tailor services to fit your needs perfectly. Please consider viewing our portfolio, or contact us if you have any questions about how we can make your landscape design and construction dreams a reality. BEST OF HOUZZ 2017 & 2018 || Dayton's favorite landscape design-build firm, J Squared Outdoor Living & Lighting proudly serves homeowners in the Dayton and Cincinnati metropolitan areas. STUNNING LANDSCAPING MADE EASY Our mission is to make it easy for our clients to get the landscaping they dream about. Once you contact us we immediately begin to guide you through the entire process. Whether its a simple landscape cleanup or a complete backyard renovation, we’re here to make it EASY. All the while focusing on great design and quality installation practices. We make sure you’re left with a product that’s STUNNING and built to last. J Squared Outdoor was founded in 2015 and is located in Centerville, Ohio. The name – J Squared – embodies our core values of Integrity, teamwork, and simplicity. INTEGRITY In the military someone who is “Squared away” Is someone who has integrity, strong character and is properly trained. At J Squared we believe in having a team that’s “Squared away” and doing work that’s “Squared away.” TEAMWORK Just as the name suggests there is more than one J on the team. Since the beginning we’ve been firm believers in working together to make things happen more efficiently, faster and smoother. Our clients consistently comment about how quickly we completed their project and how fun it was to watch us work. Our commitment to teamwork allows us to get your project finished in a timely fashion so you can start enjoying it sooner. SIMPLICITY We believe in keeping things simple. J Squared is a simple name that’s easy to remember. Simplicity is often overlooked as one of the 9 critical design elements. We think simplicity is one of the most important elements of design and of business. It keeps things clean, It keeps people focused on what’s important and makes things easy. Give us a call or message today to learn how we can partner with you on your next project! 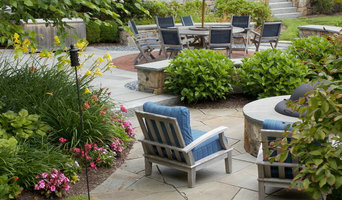 Crafting beautiful, functional outdoor living spaces in southern Maine. We are driven by a passion for the outdoors, and we love to share that passion with our clients through a design approach that focuses on functionality. Our goal is to extend your living space beyond the interior of the home and create a unique environment that enhances your lifestyle. 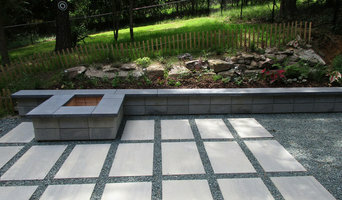 We pride ourselves on high-quality hardscape installations. 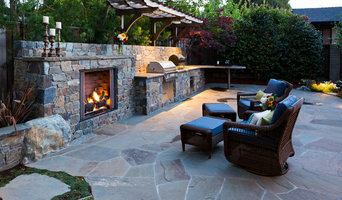 Typical elements include patios, walkways, driveways, steps, and walls, as well as outdoor living features such as fire pits and grill islands. Our planting expertise extends from large trees to turf and perennials. We carefully select our plant palette based on site-specific factors. Purposeful planting can not only create aesthetic appeal but provide privacy, anchor slopes, produce food, and more. We value the natural environment and our opportunity to enhance it, so we strive to promote sustainability and minimize our environmental impact in every aspect of our business. Water management is always a key component of our designs. Permeable pavers and native meadow plantings are just a few examples of environmentally-focused services that we offer. We are a small company proud to be a part of the communities of Scarborough, Greater Portland, and southern Maine. Owner Stewart Bell founded the company in 2017 to share his passion for the outdoors and functional approach to landscape design. A graduate of Tufts University, he works directly on the design and installation of every project. Greenbank was created in February of 2004 by Kenneth Philp, principal of Kenneth Philp Landscape Architects. The goal of our experienced, knowledgeable landscape construction and maintenance staff is to provide care that upholds the integrity of high quality and detailed gardens and landscapes. We work with clients, builders and designers throughout the greater Seattle and Eastside areas. Honest and hard working individuals that strive to create your landscape dreams. Celebrating our 40th year, Professional Landscaping Company has been in business since 1977. 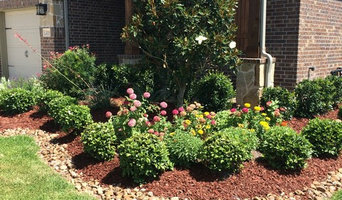 Professional Landscaping Company has provided outstanding landscaping design, installation and maintenance to Northwest Arkansas. We are fully licensed and insured, with a strong reputation in Springdale and its neighboring towns for consistently satisfying our customers. At Professional Landscaping Company, we are experts in curb appeal. Hiring a landscaping professional is said to increase a property’s value by up to 20 percent; call today at 479-751-2764 to schedule a consultation and get started improving your property.